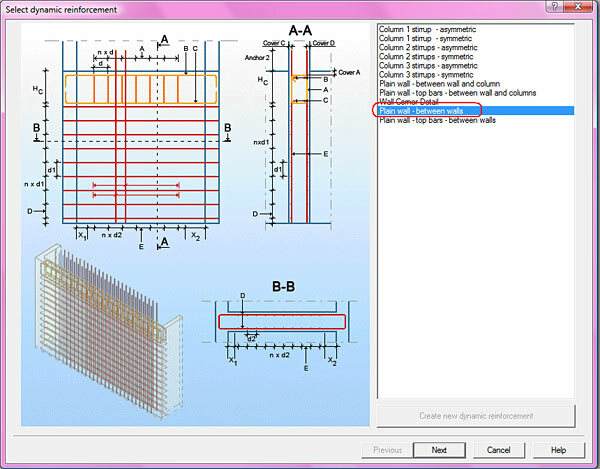 How can a Dynamic rebar solution be applied and modified in Advance Design? 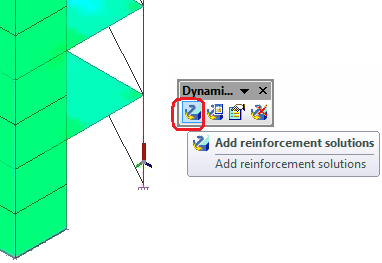 The first step is to open the "Dynamic Reinforcement" toolbar. This toolbar can be opened from the "View / Toolbars / Dynamic Reinforcement" menu. 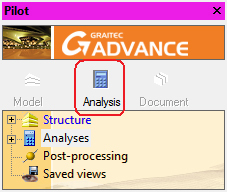 The Dynamic Reinforcement can be applied only in the "Analysis" mode. 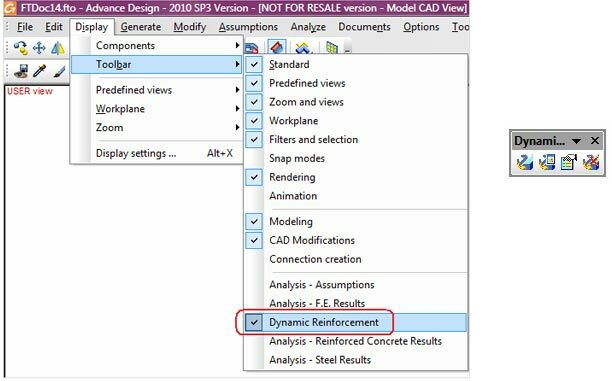 To apply a dynamic reinforcement on a structural element, the user must first select the element. If there are many similar elements that have an identical reinforcement solution, the user can select all these elements and apply the Dynamic Reinforcement solution for all the elements at once using the "Add reinforcement solution" command. 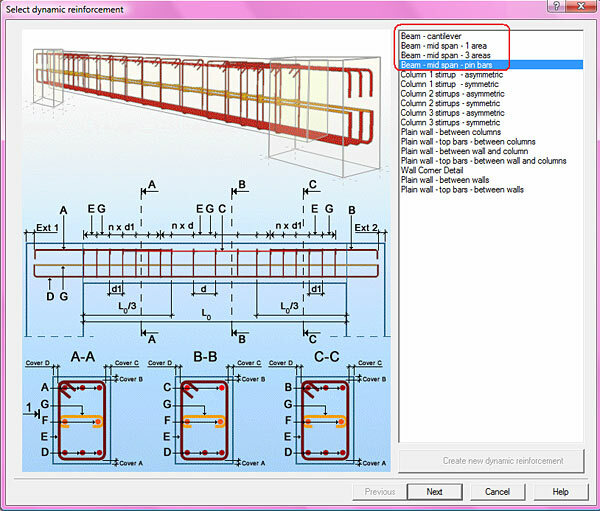 This command opens a window containing all the dynamic reinforcement solutions that can be applied for the selected elements. In this example, the "Column 2 stirrup - symmetric" solution is selected. After the solution is selected and the "Next" button clicked, the user can define the solution parameters. In this new window, the user can select: the diameter for the transverse and longitudinal bars, the material type, the concrete cover, the distances between the rectangular bars, etc. These reinforcement solutions can be exported by Advance Design to Advance Concrete using the GTC format. The user chooses the reinforcement solution depending of the theoretical reinforcement area that resulted from the Advance Design calculation. Advance Design does not calculate the reinforcement area provided by the user. To apply a dynamic reinforcement solution for walls and beams, the user must select the reinforced element (the wall or the beam) and the elements placed at the ends of the reinforced element. The existing reinforcement solution for walls and beams, from Advance Design, has the longitudinal reinforcement placed inside the end structural elements. In this example, a wall and the two columns from its extremities were selected. The user can chose a reinforcement solution for walls or for columns. There are 3 Dynamic Reinforcements defined for walls, depending of the different structural elements placed at the wall ends: a wall between two columns, a wall between two other walls, a wall between a column and another wall. All three reinforcement solutions have an inside beam reinforcement at the top of the wall. For the beam reinforcement there are 4 dynamic solutions, depending of the displacement of the longitudinal and transverse reinforcement. One of these solutions is for the cantilever. If the user wants to view all the Dynamic Reinforcement solutions, the user must use the "Reinforcement solution manager" command. In this window, the user can see, on the left, the name of the Dynamic Reinforcement solution and the number of structural elements contained by the solution. On the right, the user can see the element type (planar or linear element) and the identification number (432; 672; 97) for which the solution was applied. The user can erase Dynamic Reinforcements from the list using the "Delete reinforcement solution" command. If the user wants to modify an already existing Dynamic Reinforcement solution, the user must use the "Modify reinforcement solutions" command. Using this command the user can modify all the bar properties. If the user wants to erase all the Dynamic Reinforcement solutions, the user must use the "Delete reinforcement solutions" command. 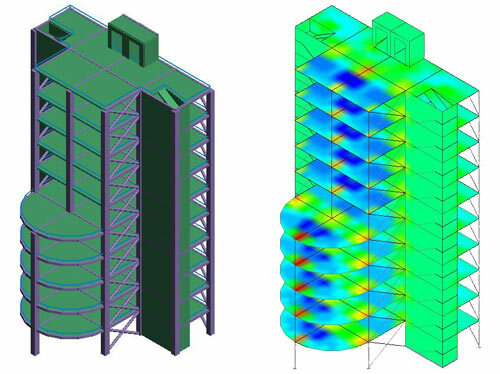 The applied Dynamic Reinforcement solutions can be exported using the "GRAITEC BIM" technology (GTC files). The engineer that calculated the structure in Advance Design can provide, using the GTC file, the reinforcement method of the structural elements used to create reinforcement detailing in Advance Concrete.